While the history of Cherokee County North Carolina is often overlooked by neighboring Eastern Band of Cherokee Indian Nation, or Eastern Cherokee Reservation, Harrah’s Casino on the reservation, with its immense opportunities in gaming employment and high stakes gambling, is a short drive to other major industries offering a variety of jobs and professional careers, including Cherokee County, forming North Carolina's western border, which offers a variety of outdoor activities for tourists and locals, and is well-known as one of the best places for retirement and its rich history. "Cherokee County is North Carolina's western most county." Prior to European contact in the sixteenth century, the native Cherokee in North Carolina subsisted by "hunting and gathering and farming." Their main crops were maize and beans. While white settlers bought their land, Cherokees grew dependent on European trade and technology and subsequently adopted many aspects of Western culture. Most depended on agriculture; some even owned slaves or managed plantations. During the American Revolutionary War (1775-1783), many Cherokee sided with the British and campaigned against the Patriots. In the summer of 1776, General Griffith Rutherford led 2,400 Continentals to fight the Cherokee in western North Carolina. In what is now Murphy, Rutherford established his headquarters and organized soldiers from South Carolina and Virginia to crush the Cherokee. Cherokee County’s white settlers migrated from the area’s surrounding counties and from other states, namely Pennsylvania, Virginia, and Tennessee. They farmed and exploited the area’s raw materials. Also, gold and silver had been eagerly sought since Spanish exploration in the sixteenth century. Precious metals were rarely found, but the mountains were rich with timber and tree bark. Other minerals such as iron ore, mica, talc, construction stone, and marble were also discovered. Europeans adopted many native agricultural habits, but also brought European traditions, such as raising livestock and poultry. The Treaty of New Echota, signed in 1835 by the United States government and a small faction of Cherokee, guaranteed the relocation of Cherokee to lands west of the Mississippi. Included in the treaty was the Eastern Band of Cherokee living in western North Carolina. In 1838, under the leadership of General Winfield Scott, over 7,000 Cherokee were removed from their native land (General Winfield Scott's Address to the Cherokee Nation: An Ultimatum). The region was a part of Macon County, but in 1839, the legislature renamed it Cherokee County in honor of the tribe from whom it was taken. The state of North Carolina named the county seat after a former legislator known for his economic vision: Archibald Murphey. Many of Murphey’s proposals, relating to public works and public schools were not adopted; however, he was known as the “Father of Education” and was a well-respected member of the legislature. When his name was given to Cherokee County’s seat it was misspelled as Murphy. Also in 1839, the first state-funded road, the Western Turnpike, connected Franklin in Macon County to the town of Murphy. During the Civil War (1860-1865), Cherokee County men fought for both the Union and the Confederacy. No major battles took place in Cherokee County, but several minor conflicts occurred late in the war; the county courthouse, in one instance, was burned by Union raiders. The mountains also provided a place of safety for war deserters. Governor Zebulon Baird Vance (1830-1894) estimated that over 1200 deserters found asylum in the mountains. In Cherokee County and other neighboring counties, the increasing number of deserters created widespread lawlessness. Vance eventually asked General Robert E. Lee (1807-1870) to send “one of our diminished brigades or a good strong regiment” to help restore order in the western counties. Often, men returned because their families were unable to survive without them. Agriculture continued to be the area’s main industry. However, after the war, many men did not return, and of those who did, many were severely handicapped and unable to perform day-to-day tasks. Therefore, the region’s economy struggled until the arrival of the railroad at the end of the nineteenth century. In 1855, North Carolina granted the Western North Carolina Railroad Company a charter to construct a railroad to serve the western counties. However, the exigencies of the Civil War (1861-1865) halted railroad construction. Construction resumed after the war, but in 1866 the Western North Carolina Railroad Company went bankrupt; so the rail line stopped in Morganton. In 1877, the railroad company restarted and extended the track to Asheville. Finally in 1888, the first railroad reached Cherokee County at the Murphy Depot. The railroad greatly changed the lifestyle of western North Carolinians. It connected the east and west and allowed more people to move to the mountains. Also, the region’s natural resources, such as lumber and iron ore, could be easily transported. Cherokee County is presently divided into six townships: Beaverdam, Hothouse, Murphy, Notla, Shoal Creek, and Valleytown. Adjacent counties: Graham County, North Carolina - northeast; Macon County, North Carolina - east; Clay County, North Carolina - southeast; Union County, Georgia - south-southeast; Fannin County, Georgia - south-southwest; Polk County, Tennessee – west; Monroe County, Tennessee – northwest. 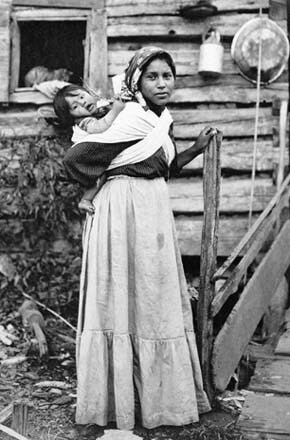 During the Great Depression (1929-1941), Cherokee countians suffered the economic hardships the whole nation endured. Many residents relocated to work at textile mills of eastern North Carolina or the steel mills and industries of Ohio and Michigan. Many found work in Cherokee County because of Federal recovery programs of the 1930s. From 1935 to 1938, the Tennessee Valley Authority (TVA) constructed many of the dams and hydroelectric power plants, such as the Hiwassee Dam on the Hiwassee and Notteley Rivers. Other works programs, including the Works Project Administration (WPA) and the Civilian Conservation Corps (CCC), provided not only temporary employment but also housing for young Cherokee County men. World War II started in 1941, and Cherokee countians once again were called to serve their country. Many men were drafted or volunteered for service, and with their traditional firearms skills were well prepared for the conflict. Also, the women of Cherokee County participated in the war effort by working in local textile mills and joining military support units. The prosperous economy of postwar America increased automobile sales and the need for highways. Modern highways made new motor carriers more competitive with the railroads and gradually railroad service diminished. Even though paved roads were constructed in Cherokee County as early as 1922, the mountains hindered highway construction, especially in comparison to other parts of the state. 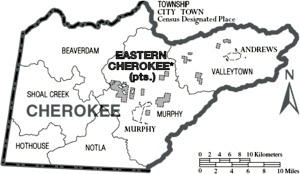 Parts of the Qualla Boundary, also known as the Eastern Cherokee Indian Reservation and Eastern Band of Cherokee Nation, are located in Cherokee County. These sections of the Qualla Boundary are non-contiguous from the primary area of the Qualla Boundary located in Swain County and Jackson County. The High Country has always been a popular destination for tourists. The Great Smoky Mountain National Park is the most visited national park in the country. Since the 1950s, native Cherokee have depended on tourism for their income. Yet many still lived below the poverty line. In 1997, the Eastern Band of Cherokees opened Harrah’s Cherokee Casino, North Carolina’s first gambling casino. Located on the 56,000-acre Qualla reservation in Cherokee County and home to approximately 7,000 Cherokee, the Casino is housed in a 175,000 square foot, $82 million complex. As its owners, the Eastern Band of Cherokee receive the largest share of the casino’s profits, and about 600 Cherokee are employed by the casino. Since its charter in 1839, Cherokee County has experienced economic and demographic change. Cherokee County’s population has grown from 3,000 in 1839 to a current population of approximately 25,000. Today, Cherokee County is a popular destination for tourists and mountain living is a popular choice for many retirees. Wideband data transmission is bringing new technology to the region, and entrepreneurs and new industries are welcomed by the citizens of Cherokee County. Adapted from the writing of "Dave Lewis, Cherokee County Historical Museum." Sources: John G. Barrett, The Civil War in North Carolina (Chapel Hill, 1963); Margaret Walker Freel, Our Heritage: The People of Cherokee County 1540 – 1955 (Asheville, 1956); John C. Inscoe and Gordon B McKinney, The Heart of Confederate Appalachia, Western North Carolina in the Civil War (Chapel Hill, 2000) William G. McLoughlin, The Champions of the Cherokees, Evan and John B. Jones, (Princeton, 1990); James Mooney, Myths of the Cherokee (New York, 1955); Christopher Arris Oakley, "Indian Gaming and the Eastern Band of Cherokee Indians," The North Carolina Historical Review, LXXVIII (April 2001); Blackwell P. Robinson, Battles and Engagements of the American Revolution in North Carolina (Chapel Hill, 1961); Bob Satterwwhite, ed., A Pictorial History of Cherokee County (Murphy, 1955); Alice D. White, ed., The Heritage of Cherokee County North Carolina, Volume I (Murphy, 1987), The Heritage of Cherokee County North Carolina, Volume II (Murphy, 1990). Try the Search Engine for Recommended Reading: North Carolina History; Eastern Band of Cherokee Indian Nation; Western North Carolina Legends, Myths, Heritage, Cultures and Customs.